This program takes a partnership approach to improving the employment and education outcomes of young people with a disability. 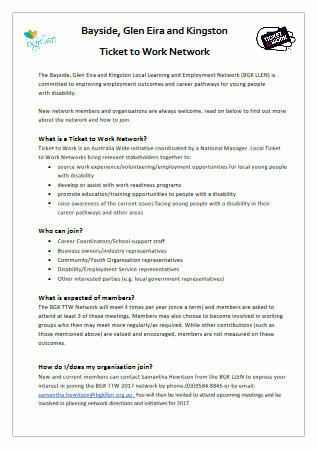 Ticket to Work takes a partnership approach to improving the employment and education outcomes of young people with disability. The BGK Ticket to Work Network brings together a range of local partners who work together to provide students with career development, workplace preparation, work experience and School-Based Apprenticeships and Traineeships (SBATs). Research shows that Australian young people with disability are not successfully transitioning from school into further training or employment; a factor that is an indicator of long term, and often life-long, disadvantage. In Australia, young people with disability are more likely to drop out of school early, be excluded from the labour force, have fewer educational qualifications, experience poverty and be socially isolated. Studies show that participation in work experience and employment during secondary school are among the most significant indicators of post-school success for young people with disability. It has also been shown that young people with disability who exit school with a job are more likely to maintain a positive career trajectory than those who do not. Ticket to Work aims to increase the numbers of young people achieving these positive post-school outcomes. For further information contact: Samantha Hewitson – samantha.hewitson@bgkllen.org.au or Ph 9584 8845.